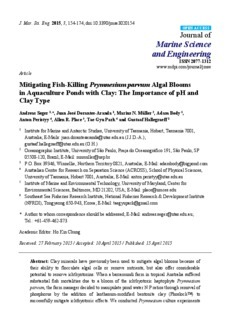 Clay minerals have previously been used to mitigate algal blooms because of their ability to flocculate algal cells or remove nutrients, but also offer considerable potential to remove ichthyotoxins. When a barramundi farm in tropical Australia suffered substantial fish mortalities due to a bloom of the ichthyotoxic haptophyte Prymnesium parvum, the farm manager decided to manipulate pond water N:P ratios through removal of phosphorus by the addition of lanthanum-modified bentonite clay (Phoslock™) to successfully mitigate ichthyotoxic effects. We conducted Prymnesium culture experiments under a range of N:P ratios, screening 14 different clays (two zeolites, four kaolins, six bentonites and two types of Korean loess) at pH 7 and 9 for cell flocculation and removal of ichthyotoxicity assessed with the RTgill-W1 cell line assay. Application of Phoslock™ to cultures grown at different N:P effectively removed 60%–100% of water-soluble toxicity of live Prymnesium (dependent on nutritional status). While most clays efficiently flocculated Prymnesium cells (≥80% removal), cell removal proved a poor predictor of ichthyotoxin adsorption. Extensive clay screening revealed that at elevated pH, as commonly associated with dense algal blooms, most clays either exacerbated ichthyotoxicity or exhibited significantly reduced toxin adsorption. Interpretation of changes in clay zeta potential at pH 7 and 9 provided valuable insight into clay/ichthyotoxin interactions, yet further research is required to completely understand the adsorption mechanisms. Bentonite-type clays proved best suited for ichthyotoxin removal purposes (100% removal at ecologically relevant pH 9) and offer great potential for on-farm emergency response.